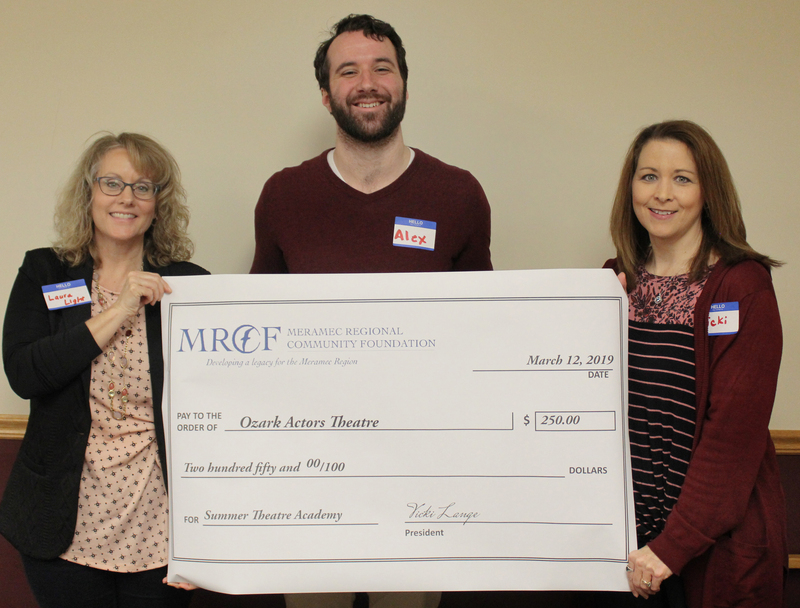 ST. JAMES—Meramec Regional Community Foundation (MRCF) awarded Ozark Actors Theatre a $250 grant for its summer theatre academy. The check was presented at MRCF’s invite-a-friend luncheon March 12 at MRPC in St. James. This year, the MRCF board reviewed a total of 18 grant applications, requesting a total of $4,414.21 and representing projects in Crawford, Dent, Maries, Osage, Phelps, Pulaski and Washington counties. Ozark Actors Theatre, Rolla, was one of six projects selected for funding. Ozark Actors Theatre has served as the Meramec Region’s only equity-endorsed, non-profit performing arts center for over 30 years. The summer theatre academy’s most important goals are to introduce children to the performing arts, give young artists and performers a starting point for honing their skills and empower them to seize future opportunities. The MRCF grant funds received will go toward helping subsidize the cost of the summer program, “Broadway Beginnings Workshop,” which costs roughly $6,000. The Bourbon Boosters for ramps to the stage at the park. Cutline: Laura Light (left) and Alex Freeman with Ozark Actors Theatre accept the ‘big’ check and the real check from MRCF Chair Vicki Lange.